I want to thank everyone for their comments and questions to reading my novel excerpts and reviewing this site. Novel specific questions are listed under that novel’s page. All other general questions for me I have gathered here. Q-What is Novellarts and how does it involve your novels? A-This is a new concept intertwining literary art and contemporary art. I want to inspire traditional and modern artist to create their art inspired by my novels. Themes, motifs, story lines, scenes and characters in novels exist in a written form that most often cannot completely make the transition from word to sight, however, a single moment can be captured. This is the source and start of inspiration. Q-Are the Novellarts Gallery submissions for cover art or a graphic novel? A-No. This is traditional art in the form of paintings, drawings, sketches and mixed media prints for the expression of art and the artist but inspired by my novels. Q-How long have you been writing? A-I have always loved to write since early in my teenage years. I began writing formally and professionally 10 years ago with short stories, then novellas, and later the longer novel format. Q-Will you only write [adult] fiction? A-No. Non fiction and memoirs is on the list also and a number of short stories. Q-What happened to the About Me blog section? A-I received far too many responses on the About Me section which took focus away from the novels so for now it has been removed. Q-I have always wanted to write and get published, but how do I start? A-Well first, write! I believe good writers are often good readers so read frequently and read across different genres. I start by developing a very general outline for what I want to write and on a daily or weekly basis I add thoughts to it. For me it helped to be well organized, for example with La Razza di Trenta Nove I had to constantly keep in mind the hint of a pre World War II Europe and how different it is today. Stephen King says that he often writes a novel and puts it away for several months and then goes back to revisit it. I took an unintended similar approach and it helped refine my storyline. Don’t even think of publishing until you finish writing. Q-What type of novels do you like to read? A-I like contemporary mainstream fiction which for me can range in style from Andrea Lee to Upton Sinclair. Q-What novel [or literary work] has had the greatest impact on you as a writer? A-(I know this goes against the preference above but they are called classic for a reason.) Reading Dante Alighieri’s Divina Commedia had a great impact on me in grade school. Each one of these three novels contains a very small passage from it. In middle school I challenged myself to read at least 120 books in each grade from 6th to 8th. The school’s library was small but had the classics so very early on I read amongst others Divinia Commedia, Voltaire’s Candide and the Lord of the Rings series. It was not until much later in high school and college could I really appreciate their social commentary and aesthetic value. Q-Will books become a thing of the past? How is technology playing a role in the modern book? A-Books and the words they carry will never go away. Computers and technology make it easier to access and read books in different formats. I strongly support books in alternative formats especially for use by the blind. Q-Are you a member of any book clubs? A-Yes and I strongly recommend anyone new to writing join a book club that will expose you classical and contemporary literature. There are some very good books clubs online. Q-Do you work with any other writers or do you read other writer’s manuscripts? Q-Is Patricc Fortiori a pen name? A-I have no political affiliations. A-I live in a metropolitan city with a population of just about 6 million people and to think of that many people killed boggles the mind, however, to see and recognize the cruelty and depravity of man boggles the imagination. Yes, I think the number is accurate. Q-Where do you get your ideas from? A-I call it “liberating my creativity and imagination!” This usually starts with a central theme or a complex character. For example, The 44th Amendment started with a question of how American’s view what form of freedom is most important to them and the furthest length a man will go to have freedom for himself or destroy it for others. Q-Do you look forward to TV or movie adaptations? A-No. My preference is to write for readers. Q-Have you portrayed yourself or personal friends in your novels? A-No, however the characters in the novels sometimes unintentionally resemble the lives real people and their specific plight. For example, the vibrant and enigmatic 72 year Senator Porter in The 44th Amendment who loses his first wife and remarries a woman far younger than he is. Q-How do you stay organized writing a novel? A-I concentrate on one project at a time but sometimes new ideas flow in while I am writing. I jot those ideas down or get back to them later. Q-Did you write these longhand or on a computer? 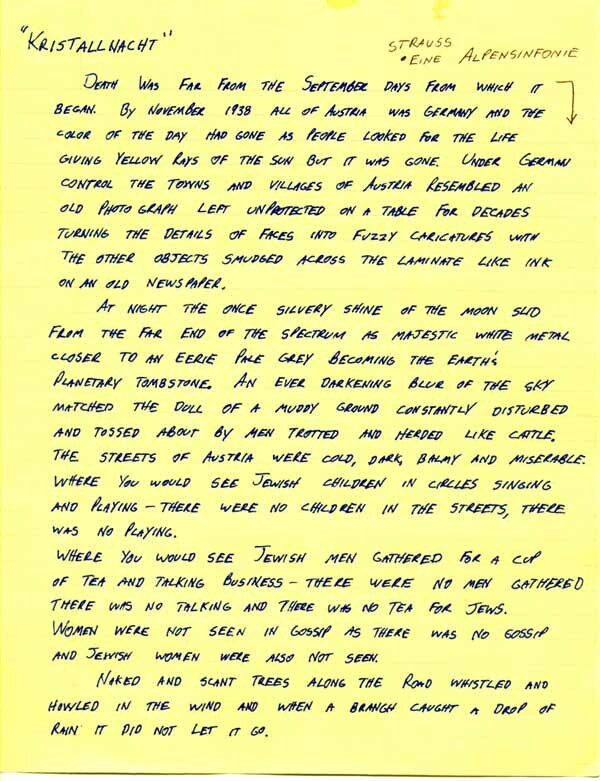 A-Some of the original outlines, detailed story synopsis, themes and character profiles were hand written. For many years I could write faster than I type so a good quantity of each of these novels were written long hand in their first editions then transcribed. In 2008, Hurricane Ike left me, along with tens of thousands of others, without power for two weeks and in that time I had to hand write all revisions and updates. Q-Your novels seem to appeal to adult readers but what about teenagers and younger ? Looking For The Genius’ central character is a teenage girl in a coming of age story. As readers go, teenagers read adult novels and pre-teens read novels meant for teenagers. Nothing attracts a 12 year more than a rating that suggest for 15+! Q- (Agent) Are you a journalist in some area of print, TV or electronic media? No, my only interest in is writing and publishing these novels and this blog. Q- (Agent) Are you under contract or has does anyone else have this work? I am an independent writer with no contracts, nor an agent and no one else has these novels. Q- (Artist) Will the novellarts gallery have a competition, auction or prize winnings? There is a significant demand for this so I taking it under consideration. Check back for details. Copyright 2009-2019 All editorial content, novel synopsis, book excerpts and graphics on this site are protected by U.S. copyright and international treaties and may not be copied without the express permission of the author Patricc Fortiori, who reserves all rights. Re-use of any of this site’s editorial content, novel synopsis, book excerpts and graphics for any purpose is strictly prohibited. The materials from this site are available for informational and noncommercial uses offline only, provided the content and/or graphics are not modified in any way, all copyright and other notices on any copy are retained and permission is granted only by the author Patricc Fortiori . Novellarts and Novellarts.com is a trademark of Patricc Fortiori. For more information: pfortiori@novellarts.com.